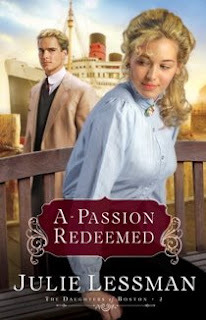 Today, I have an interview with historical romance author Julie Lessman about her latest novel, A Passion Redeemed! And now, here’s me and Julie! Charity was the "bad girl" in your first book, A Passion Most Pure. What made you decide to make her the heroine of her own story? What's your favorite scene from A Passion Redeemed? Oh, man, there are so many! Tender ones between Charity and her father that rip my heart out, scenes of reckoning where Charity feels the pain of her wrong decisions, AND, of course, love scenes that flutter my heart. But, in the interest of time, I will “show, not tell” my favorite romantic scene. It’s set in the kitchen where our hero is helping Charity with the dishes. Her chuckle cleaved to her throat when he lowered his gaze to her mouth. The breath in her lungs shallowed, drifting out in short, raspy breaths. “You’re still not drying,” she whispered. He moistened his lips, then slowly lifted his eyes to hers. “I need this.” His fingers skimmed across the towel on her shoulder, causing the air to still in her throat. Dear God, what was happening? It was as if he had no control over his hand as it strayed from the towel to the soft curve of her neck. A tilt of her head, the blush of her cheeks, and suddenly he was two different men. One whose every muscle, thought and desire strained toward wanting her. The other, a distant voice of conscience and memory, quickly fading with every throb of his renegade pulse. Curse the effect of the wine! What else could explain this driving insanity pulsing through him right now? His fingers burned as they lingered, slowly tracing to the hollow of her throat. Against his will, he fixated on her lips, lush and full, staggered at the heat they generated. What was he doing? He didn’t want this. All night he’d felt it mounting, a desire in his belly that grew tight at the sound of her laughter, the lift of her chin, the light in her eyes. A woman with cool confidence around everyone but him. Call it the wine. Or the fact he hadn’t been this close to a woman for well over a year. Or the intoxicating awareness that his very presence seemed to unnerve her. Whatever name it bore, it had him by the throat, taking him places he’d vowed he’d never be. A soft mew left her throat, and the sound ignited him. He pulled her close, his mouth demanding hers. She moaned while he pressed her to the counter, holding her there as he deepened the kiss. With a deep groan, his arms swallowed her up, drawing her small frame tightly against his. He pressed his lips to her hair, allowing her scent to flood his senses … to consume him. His heart seized. What was he doing? The more he touched, the more he wanted. But she had ruined his life. Dashed his hopes. Destroyed his dreams. Dear God in Heaven, he wanted her … but he didn’t want her. If Charity were a piece of jewelry, what would she be and why? Probably a tear-shaped diamond on an 18-inch white gold chain. One that shimmers and shines above a low-scooped neckline, teasing and taunting as it rests just inside the hollow of her breasts. Tear-shaped because her quest for love without God in the middle will only bring her pain. And the 18-inch chain because she is the type of woman who thinks dangling her charms before men will secure a man’s heart. An Irishwoman’s Tale by Patti Lacy, and although I am not usually a women’s fiction fan, this book has mesmerized me with its vivid imagery and haunting story. It is wonderfully well written. Just that I want to thank you, Camy—for allowing me to connect with your readers. Also, I LOVE to hear from my readers, so they can contact me through my Web site at www.julielessman.com, either by sending an e-mail via my site or by signing up for my newsletter, in which I feature book giveaways. Finally, I invite your readers to visit The Seekers, a group blog of which both you and I are a part that talks about “The road to publication. Writing, contests, publication and everything in between.” You can find it at http://seekerville.blogspot.com/. Camy here: Thanks for being here, Julie!